In my experience, there are two kinds of beef people. On one side of the spectrum are the rare or medium rare guys, who want theirs soft and red, possibly still kicking. And waaay on the other side, the well-done guys, who for some unfathomable reason, want theirs gray throughout with the texture of leather. As you can tell from this recipe, I am definitely of the rare group; just give me sliced beef, salt and the juices from the meat on the plate, and I am in carnivore heaven. Salmoriglio is an Italian herb sauce used to drizzle on pretty much any meat or fish. 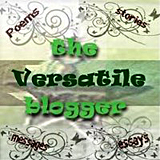 It can be made from your choice of herbs, including, marjoram, thyme or lemon thyme, or as I have, with oregano. This oregano sauce is not for the faint of heart, I admit. It has the assertive flavor of fresh oregano and, along with the lemon juice, salt and olive oil, my taste buds are still singing twenty minutes later. 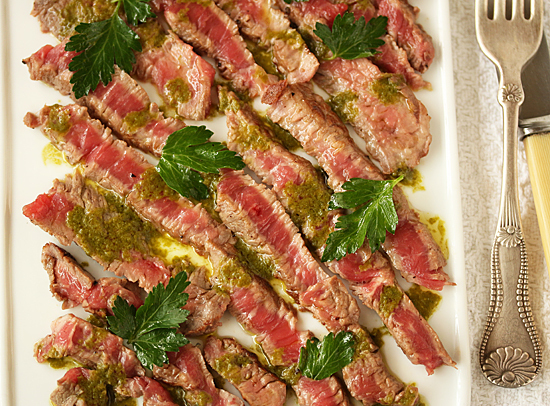 I love it in combination with the soft sweet rare beef with crispy grilled brown edges, and the fresh herby-ness of Italian parsley tossed with lemon dressing that is sprinkled over. 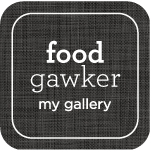 Oh man… sooo good. 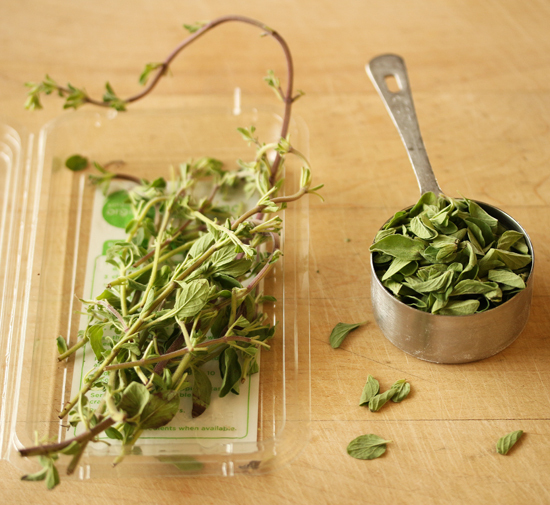 Fresh oregano leaves are quite soft and we need a half cup packed for this recipe. I am using my big mortar and pestle, and we start out with the oregano leaves and some kosher salt. 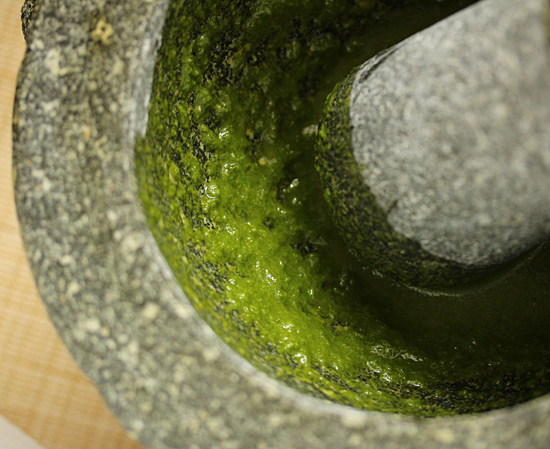 The leaves are pounded with the pestle until they are well crushed, then ground to a fluffy paste. Next the lemon juice is added and ground into a smooth sauce. The olive oil is mixed in and the whole mixture is scooped into a container with a flexible spatula. Here you can see the rib-eye with its rare center, fat and gristle trimmed. The odd bits of meat are drizzled with the Salmoriglio for that first trial bite. Your taste buds shout WOW! Happy. Happy. Happy. 1. 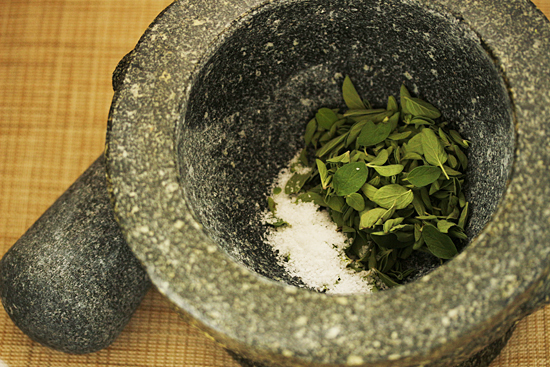 In a mortar and pestle, pound the oregano leaves with the salt until crushed. 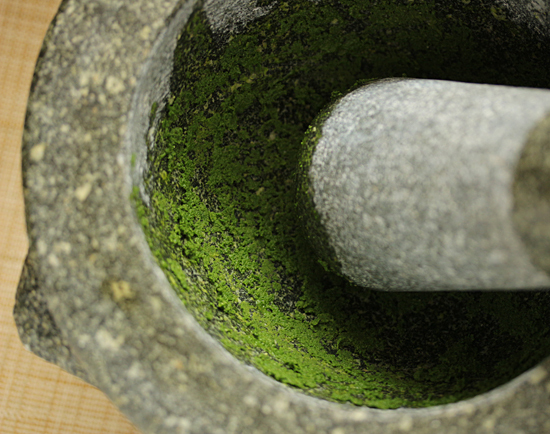 With a circular motion, grind leaves to a moist and fluffy paste. 2. Add lemon juice to paste and grind to a smooth sauce. Drizzle in olive oil and mix. Using a pliable spatula, transfer to covered container, add a dusting of pepper and reserve. Note: For a variation, other herbs may be used in place of oregano, such as marjoram, thyme or lemon thyme. 1. In a non-stick frying pan, heat butter over high heat until starting to brown. 2. Dust steak with salt and pepper and sear briefly in butter until browned on both sides, making sure the center remains raw. Place on plate to cool. 3. Slice cold beef into thin slices; the seared edges will hold the pieces together. 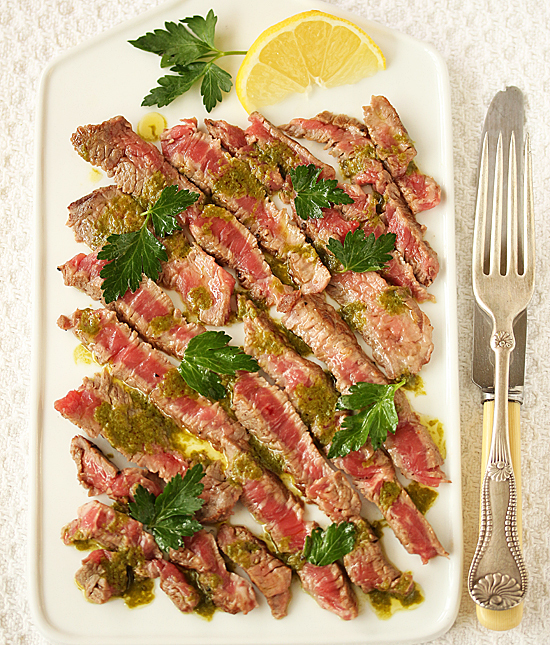 Arrange slices attractively on individual plates or one large platter, and drizzle with Salmoriglio sauce. 4. Toss the Italian parsley leaves in the Oil and Lemon Dressing. 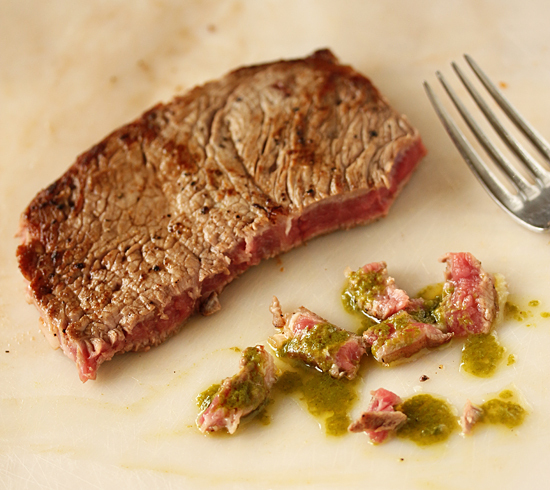 Using fingers or tongs, sprinkle sparingly over steak. Discard dressing remaining in bowl. 5. Pass additional Salmoriglio sauce at table. 1. In a medium bowl, whisk together dressing ingredients and reserve. Love my beef rare and this looks sooo good. Lynne, you need some of my fresh oregano I have growing here. Let me give you a starter plant for your garden. What a beautiful presentation, and I’s wager that this is absolutely delicious. “Sal sauce” as we called it at home, has always been a favorite of mine, and what a fine match it is for beef, especially with oregano. Complimenti amica! It looks like you are settling in beautifully to your new kitchen. Also may I add that I love the look of your flatware arrangement. Placing the knife atop the fork is genius. Brava! Wow, it’s like an oregano chimichurri! Never even heard of this sauce before. How did you get the cow to pose for you like that? Stunning presentation!